The question that is on every parent's minds. Are fun books just mindless fun or are they also educational? Well, the first priority is to keep books fun. Of course, if you can also include some boring stuff, you have a winner on your hands. In real life, some topics are simply too boring for kids - they just switch off. Plead with them, reason with them, beg ... nothing helps. Many authors have tried to make books that entertain and educate - only to fail miserably, as children's radars are fine-tuned to detect thinly-veiled attempts to "lecture" them. Fret not. There is salvation around the corner. Believe it or not, Officer Buckle and Gloria is a picture book that is all about the dreaded "R" word. And your kids will lap it up. No, this is not a picture book about fun rules like: "Always take a shower with your cat" or "Brush your teeth only if your parents buy you an X-large lollipop"
No, this book is about the real heavy stuff. The dreaded "Never play with matches" and "Never put things in your ear" stuff. It is about safety tips. You heard me well. Get ready for a revolution in your house, as your little ones will be attracted to safety tips as moths to a fire. Yes, this is a book that will turn their world around. Too often a didactic book for kids is boring. It is a mean feat to find one that is pleasurable and entertaining instead. Kids love it when you put some fun center stage and "disguise" the lesson. Children are not naive, they know there is a lesson hiding inside, but they appreciate the effort to make it entertaining. 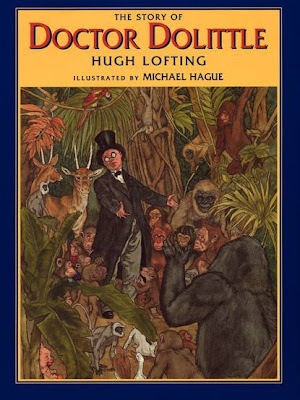 In our home, as a result of reading this book, we had our first serious talk about the danger that strangers can represent and how important it is never to accept food or drinks or presents from strangers. But this time around, my kids asked for safety tips. All of a sudden, they started craving safety tips. They wanted to understand all the little safety tips that are listed on the little scraps of paper that Officer Buckle thumbtacks on his board. Why you should never drink things you find under the sink? Why you should never put things up your nose? Why you should never play alone in the car? They want to know the details. Crazy! All of a sudden, my twins became little safety freaks. Safety Tip #77: Never stand on a swivel chair. But this is not a fluke. Officer Buckle and Gloria is a testament to what is best in children's literature: making reading FUN. 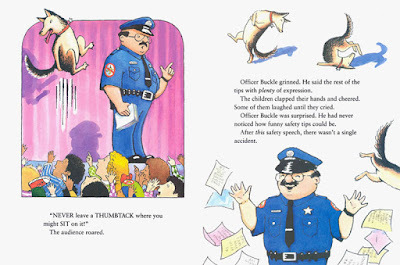 Even before you start reading Officer Buckle and Gloria, your kids will know it is a hilarious book. The screaming colors, the cartoonish characters and the masterful cover page meant that my twins were fighting over the book as soon as they saw it. Will it work for your kid, you wonder? I've got two words for you: policeman + dog. Officer Buckle from Napville has an important task. He is the police officer of choice for schools, when it comes to presenting safety lessons to pupils. Officer Buckle from Napville is dedicated to his job, he is meticulous and orderly. Alas for him and the kids who listen to him churning out his safety tips, his presentations are also mind-numbingly boo-oooring. Aftterward, it was business as usual. Yes, the more he tried, the less effect he had. Everything changes one day when the Napville Police Department receives a police dog named Gloria. When she starts accompanying officer Buckle to his school presentations, good-natured Gloria stirs up emotion and commotion. She stands behind officer Buckle and starts mimicking the advice that he is giving. She steals the show secretly, while back-miming every safety tip that the police officer reads. By pantomiming the advice officer Buckle gives, she breathes life into his dull words and the audience rolls with laughter. The audience is engaged and the safety tips are finally taken to heart by the kids who start writing fan mail to Gloria and officer Buckle. Yet, the joke is on poor officer Buckle who is the only one unaware of what is going on behind his back. Eventually, after discovering what Gloria was up to, the partnership cools off until one day the police officer comes to understand that the secret to his success was Gloria all along. Author and illustrator Peggy Rathmann, who won a very well deserved 1996 Caldecott Medal for Officer Buckle and Gloria, in this picture book did exactly the opposite of what her main characters are doing. Fun is clearly center stage in this picture book, while the lessons about teamwork, safety and camaraderie are lurking from the background. I love this book so much I gave a copy to my own Officer Buckle, my sister. She's our family's safety patrol. 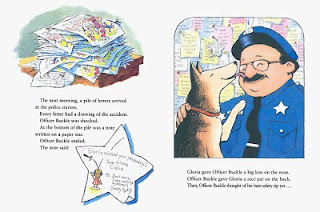 Officer Buckle and Gloria is such a memorable book - perfect for giving away as a present. Especially to the safety minded! This is a wonderful book, and I really enjoyed your review too. I've read Officer Buckle several times with my kids. Not long ago, I read it with some students and they all wrote safety tips. My favorite was by a girl whose mother is a violin teacher. Her tip was, "Don't fight with violin bows." She illustrated her tip with a picture of her and her sister, you guessed it, whacking each other with violin bows. I almost spit out my mouthful of coffee over the laptop keyboard as I read your comment! "Don't fight with violin bows" indeed! I'm still laughing like crazy at that, thanks for sharing it with other readers. Thanks for your kind words too! How I LOVE Officer Buckle and Gloria! Such a fun book! I found it years ago off the Boston Public Library book list of picture books but it's been one of our absolute favorite picture books! Love the illustrations too! I have it on my list of Best Picture Books You've Never Heard Of http://www.pragmaticmom.com/?p=51 but LOL, of course YOU know about it! This book was already on my wish list, but you made me move it to the top. I do love it! Thanks so much! Glad you enjoyed the post, the book is really a treat! I adore this sharing of book tips, back and forth, back and forth. The internet, great blogs like your own - Jen Robinson's Book Page (Growing Bookworms) - and messages from parents, teachers and librarians have completely shaken up what I know about children's books. Our library would be so much poorer without all the information that other people share so selflessly. A simple message, blog post or comment can unveil a new undiscovered treasure and it is so rewarding! I knew you would love this one, it is such an unlikely topic and yet such an engaging book. Thanks for mentioning that list! What a great list of books it is! Books that deserve to be on a list - many of them we love as well.